We’re in the homestretch toward spring and I’m sure I’m not the only one who is pining for warmer weather and the fresh, gorgeous produce that comes along with it. 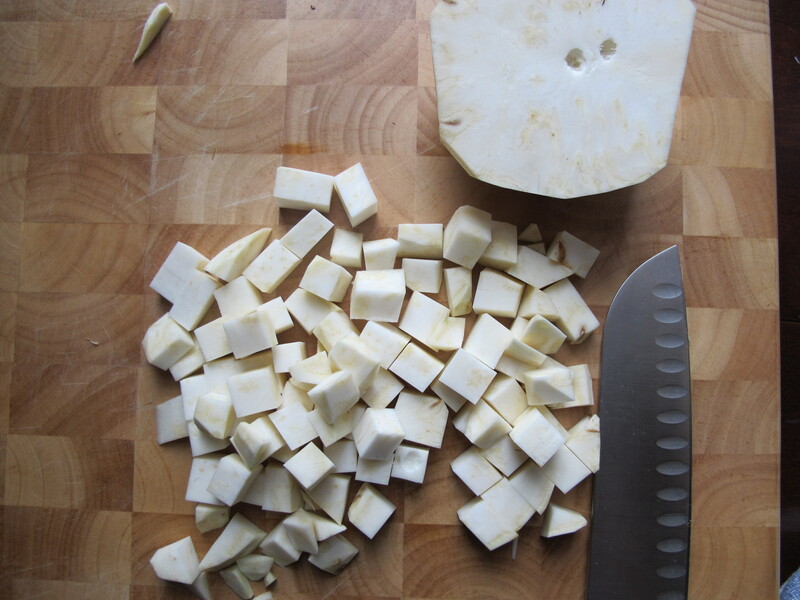 In the meantime, allow me to introduce you to one of winter’s more underrated vegetables, celeriac (or celery root). Celeriac’s flavor and texture make you think it’s the love child of celery and potatoes. Celeriac is literally celery’s root, but instead of varieties that grow big beautiful stalks, they are varieties selected and cultivated for their roots. They are much lower in starch than a lot of root vegetables, a good option for someone who needs to control the carbs in their diet. This homely looking root can be a little intimidating with it’s dinosaur skin and tangle of roots, but once you get past its exterior, it’s creamy, nutty, and vegetal. It adds great dimension and flavor to nearly any dish in which you would use a potato. 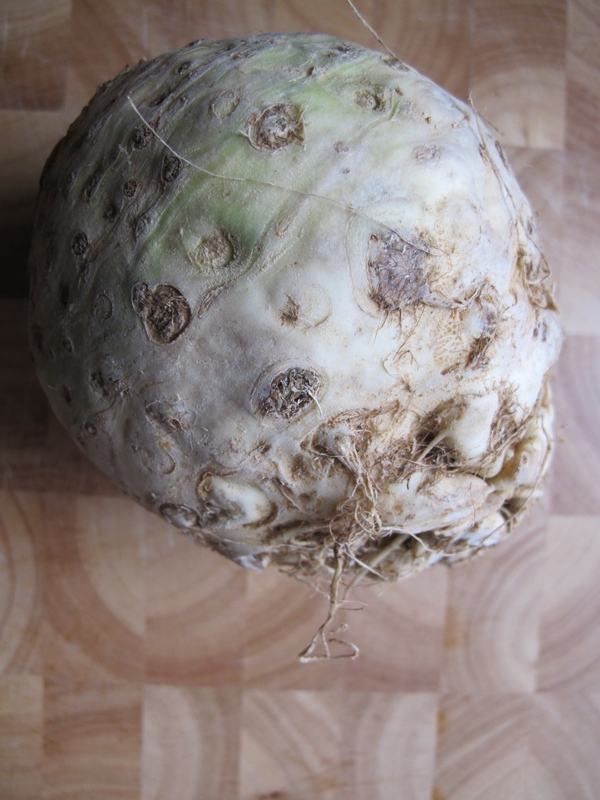 Choose celeriac with as smooth a skin as possible, not soft and browning or cracking and dry. It should feel a lot like a big turnip with knobby skin. They store well in the crisper drawer of your refrigerator for a couple of months if they’re in good shape when you buy them. Now, here’s how you get to the good part. 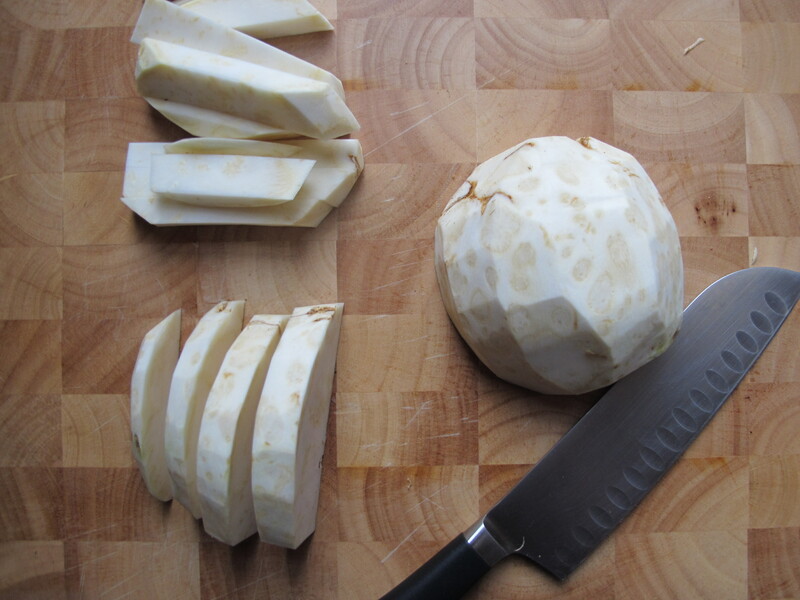 With a sharp chef’s knife, cut a slice off each end of the celeriac. You are just cutting enough to create a stable base so don’t worry about getting all the root end off yet. Any gnarly bits can easily be trimmed with a paring knife after the root is broken down a little bit. Then, much in the same way I showed you how to peel citrus with a knife to segment it, trim away the knobby skin from top to bottom, following the curve of the vegetable with the knife blade. 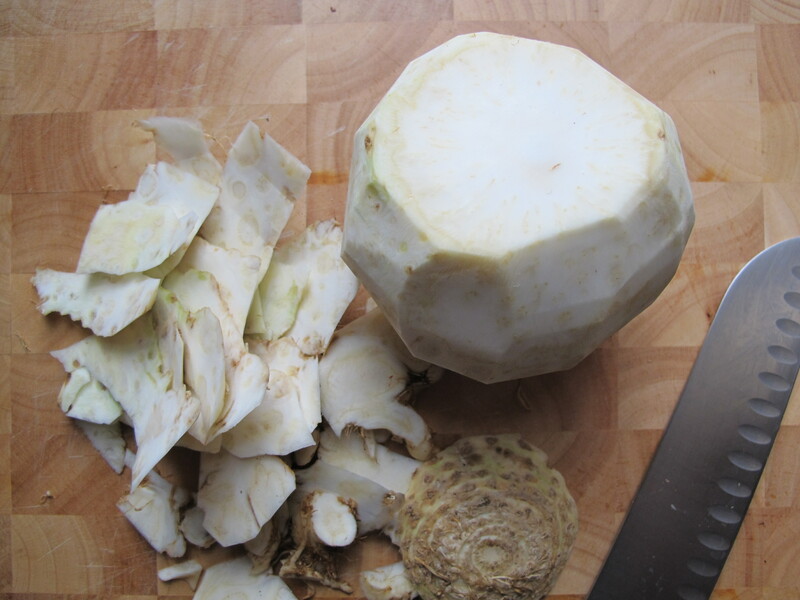 If you have a small celeriac and a very sturdy vegetable peeler, you can try cutting the root in half and then peeling it with the peeler, but most celeriac are a little large to grip safely and a little tough for a standard vegetable peeler. A sharp knife makes quicker, safer work of peeling it. Once the root is peeled and you’ve trimmed away any unsightly roots, cut the whole thing in half. From this point, the celeriac becomes much more manageable to cut into whatever size you need for your recipe whether it be thin slices for a gratin, grated for a remoulade or slaw, or diced to cook into soups or with diced potatoes for a delicious addition to mashed potatoes. To create a dice cut, lay the half flat-side down on the cutting board and cut each half into ½ inch wide slices. Again, divide the root into quarters, lay them on their widest flat side and cut each stack of slices in half lengthwise, turn it again, and cut the slices into about ½ inch dice. Because it’s rounded, the pieces won’t be completely even but this is a good way to help ensure that your pieces will cook pretty evenly. This approach works with a lot of big, tough, round vegetables like jicama, turnips or rutabagas, and potatoes. Bring the soup to a simmer, stirring occasionally. Cook for about 25-30 minutes at a simmer until the lentils are tender. Keep and eye on the liquid level as the lentils absorb water and evaporation occurs, adding ¼ cup at a time to the pot. Once the lentils are tender (the carrots and other vegetables should also be tender but not mushy at this point) pull the kombu out and chop it into small pieces and return to the pot. Add the shredded greens and stir into the soup to wilt them. If you’re using kale or chard, bring the soup back to a simmer for about 5 minutes. Spinach and tender mustard greens will cook in the residual heat from the soup. Check the seasonings and add more salt and pepper to taste.